When I saw Hiroe Nakata was the illustrator of this book, I got excited because my daughter and I had long ago fallen in love with her work in Dashka Slater’s Baby Shoes and Jane Yolen’s Time for Naps . Nakata consistently delivers with her distinctively loose and energetic illustrations in Deborah Lee Rose’s story. Each page displays a colorful ocean life scene corresponding with oversized black text of sentences parsed for young children who are learning to read (my daughter was able to pick out a few words). 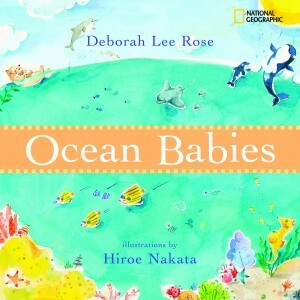 I was slightly disappointed there were no rhyming and rhythmic phrases to assist children with reading but Rose covered an ocean of material, consulting with several marine biologists and publishing with the National Geographic Society. 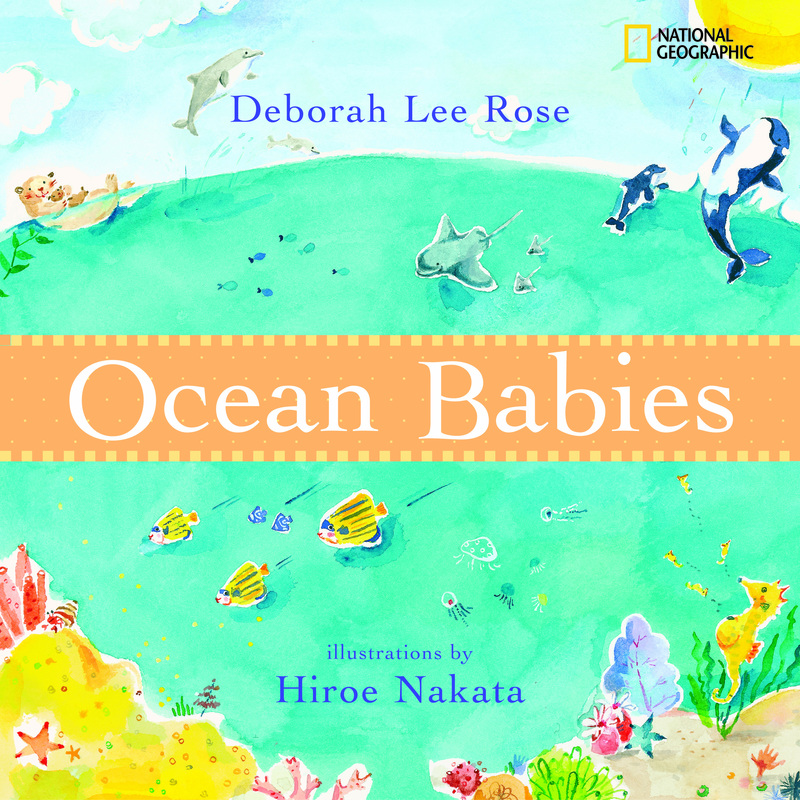 Rose and Nakata fill the pages with a fascinating glimpse of animals sharing the ocean to engage the little budding marine biologist. Additional details are found at the back of the book about the animals depicted in illustration and hinted at with words. The diversity and variety are expressed with each sentence phrasing and image which describes opposites such as “Big as a bus, and smaller than seeds” found in ocean babies. The analogy to humans builds up to the end of the story when it is made clear with the words, “No matter where they live, what color, shape or size, one day ocean babies grow up just like you will.” I always want to cheer when books promote diversity and an appreciation of what makes us unique and what connects us. I also liked how the end of the story repeats the beginning, emphasizing the cycle and circle of life. Although I like the idea of introducing young children to life science, I have some mixed feelings about the metaphorical can of worms tossed into the water with the page that illustrates the words “[babies] wriggle and spurt from their mother’s body– or their father’s!” I may be jumping the gun or reading too deeply into it but I don’t think it’s a far leap from discussing birth to diving into the deep end about how the babies got there. Some parents may feel comfortable delving into the birds and the bees (or in this case, the dolphins and the seahorses) with their four year old but many parents I know are hoping to put it off a little longer (long enough for someone else to explain) for fear of choking on the words. With the comparison to human babies and parents, daddy seahorses birthing the babies may be a little confusing for a young child. (I’m still scratching my head why human daddies can’t do it.) Even though I like to think myself progressive, the concept of live birth in a child’s story took me by surprise and the juicy wording itself shocked me a bit along with an image of the dolphin mother in the process of “spurting” her baby out. (The pregnant seahorse daddy was anticlimactic after the dolphin birthing; it would be quite opposite for humans since live births by mothers are a dime a dozen but mythical pregnant fathers would rock the world.) During the first read-through, my preschool-age daughter hasn’t asked about it, but I suppose this is an opportunity for me to prep some speeches in case she has questions… or I could always refer her to Daddy, who isn’t as accomplished as a seahorse.